Party will also up the Living Alone Allowance. Fine Gael: No substantial commitment to investment in Sligo industrial or service sectors. Fianna Fail is promising to raise the state pension – that is if they are in government following the general election. A press release issued on behalf of Senator Marc MacSharry states that the party will increase both the contributory and non-contributory rate by €30. They will also improve the Living Alone Allowance by €15, says the statement. In Sligo-Leitrim Fine Gael’s position is more or less as it has been for the last five years – no significant new investment in industrial or service sector provision, and no substantial commitment to tackling business closures, struggling enterprises or the area’s joblessness, migration, and emigration. Homelessness is at a record high. It is said party TD, Tony McLoughlin is encountering squalls of protests regarding the water charges, property tax and the carbon levies that have added hugely to the household costs of heating oil, gas, briquettes, diesel and much more besides. Fears are growing that if Fine Gael is returned to government major increases in the family home tax will follow sooner or later. The party is also adamantly sticking to its decision to maintain water charges – it is also felt they will roll out a higher charge for metering and a raft of other consumer costing measures, possibly including levies on household and other insurances to create a fund for the alleviation of flooding problems in parts of the country. Taxation appears to be a mindset of the Coalition as a whole – not even the anger it is arousing within weeks of the general election has deterred them from setting conditions for what inevitably is destined to be higher charges for household waste collection. Fianna Fail has stated that there will be no water charges in the lifetime of the a next government they might be part of. Not much reassurance in that for consumers – after all, Fianna Fail signed up the country to water charges, the creation of Irish Water and the taxation of the family home in the agreement with the Troika. It is a legacy the Fine Gael – Labour Coalition have continued to operate in spite of the hardship it has inflicted on families throughout the country. 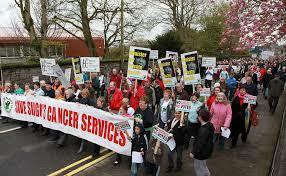 At a local level, the electorate has not forgotten the demolition job that the previous Fianna Fail-led government did on cancer services at what then was Sligo General Hospital and their cold dismissal of the widespread protests by sick and elderly campaigners desperately seeking to have the services retained. The subsequent efforts of TD John Perry to secure the restoration of the facilities might have been successful if he had not been let down by his party in government.